Leeds head coach Steve Evans believes the club need better players if they are to challenge for the play-offs. 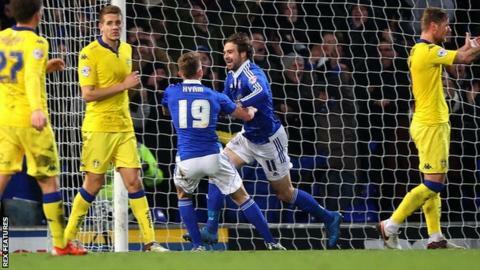 The Elland Road side's eight-match unbeaten run came to an end with a 2-1 defeat by Ipswich on Tuesday. "Everybody knows that we need better players," he told BBC Radio Leeds. "We've got some good players here but we need to get some quality into the club. If the benchmark for getting in the play-offs is Ipswich, then three players could change that for us." He added: "It's frustrating because we're trying to sign better players and they come from better levels and therefore it's up to the people behind me to try and get them in." The defeat at Portman Road means Leeds are now 12 points outside the Championship's top six with 20 games to play. So far this month they have extended the loan deal of Sunderland midfielder Liam Bridcutt until the end of the season and signed Middlesbrough winger Mustapha Carayol on loan. Evans felt his side lacked application in their defeat by Mick McCarthy's men. "We controlled the early stages but then players started to try and become good players and try and do little flicks around corners and not match runners because they're waiting to attack in the next phase. That's not how to win matches," he said. "We were really professional and excellent for 15 or 20 minutes and then we had individuals who wanted to attack before we had good possession."